As president and vice president of two of the strongest shopping business federations in the shopping capital of Japan, Tadashi Senda has the knowledge, networks and grassroot support to biring a true Osaka flavor to the IR environment on Yumeshima. Over 300 shopping mall associations with more than 10,000 individual storefronts and 160 shopping district promotion associations trust his leadership. With members from the local everyday shopping mall to the highly specialized and popular kitchen tool district where you can find master chef’s knives, Senda has the history and culture of shopping malls in Osaka at arm’s reach. President of top brand door handle maker Union LLC with a 90% domestic market share. Engaged in architectural and environmental study and research, international exchange, and the founder of the annual Union Design Award which honors extraordinary design talents and young business people. The Union Design Award’s selection committee comprises of board members of the Union Foundation For Ergodesign Culture, world renowned architect Tadao Ando and other top level experts. Tateno is honorary president of Save the Children Japan, a private international aid organization officially recognized by the United Nations, and a former chairman of the Osaka City Board of Education. Vice President of the 30,000 member Osaka Chamber of Commerce and Industry, Tateno believes that IR will be the spark that ignites the revitalization of the Osaka and Kansai economy and suggests planning that will create local business opportunities. With Saraya Co., Ltd. present in 22 countries, Yusuke Saraya contributes to the hygiene, health and environment around the world. Well known in the Osaka business community being part of the Osaka Chamber of Commerce and Industry and the Kansai Economic Association, Saraya works actively with small and medium-sized enterprise policy, decentralization, education, and the revitalization of Kansai. While presiding over the Junior Chamber International Japan in Osaka he established Save the Children Japan in 1986. He later went on to serve as president of Junior Chamber International Japan in 1989, an organization which holds the world’s largest youth conference.. With knowledge of the environment, biodiversity and sustainability he deeply contributes to society both regionally as well as in developing countries. GOURMET KINEYA RESTAURANT CO. ,LTD. In total 418 stores serving over 100,000 customers daily nationwide, Masashi Mukumoto has created hugely popular restaurants including Gourmet Kineya (handmade udon noodles), Sojibo (Shinshu soba noodles)“, Gourmet (sandwiches), and Tenhana (tempura). Other important business areas include the in-flight meal industry, frozen food manufacturing, and real estate rentals such as the Kizu local produce wholesale market in Osaka. Founded in 1946, Imai is the third generation proprietor of famous udon restaurant “Dotonbori Imai” with ten locations in mainly in hotels and department stores in Osaka city. A former president of the Dotonbori shopping district association he has actively been working for the development of a bright, safe and clean downtown, the revival of local Naniwa culture, and increasing the number of international tourists. IR inspires Imai to promote Osaka with the experience of Dotonbori’s human touch and rich culture at heart. Taking over a single failing shop with only 12 seats in the year 2000, Katsuya Ueyama overhauled the business and incorporated it in 2003. With the now famous tagline “No double dipping!”, often seen on TV, and boasting a reputation as a symbol of energetic Osaka, he is a driving force in the local food and entertainment tourism. As current president of the Dotonbori shopping district association he has set his sight on being a PR ambassador to boost the momentum for IR in Osaka. GANKO FOOD SERVICE Co., Ltd. Starting with a tiny sushi shop on his own in 1963, Tatsunori Kojima has been president since the very foundation of the company. In 1965 he opened a much larger sushi restaurant with 106 seats and from there on developed a successful food service business which highly values the traditional culture of the Japanese cuisine. Operating mainly in the Kansai and Kanto(Tokyo) regions, Ganko has expanded to over 100 stores with their slogan of delicious, affordable and fun. Purchasing historically valued traditional Japanese houses for reuse as restaurants, Ganko is currently operating nine such locations in the Kansai and Kanto areas. With a staff of 3,530 and 1.3 million inbound visitors per year, Ganko enjoys a strong presence in Osaka and plans to open in Taiwan during 2019. Tatsunori Kojima is the president of the Local Alliance. Kansai Inbound Association Co,. Ltd.
With Osaka Wonder Loop Bus servicing 14 sightseeing spots, Osaka Wonder Cruise brining tourists onto the city rivers, tourist information centers and Kansai International Airport and Rinku Town, Kansai Inbound Association stands in the center of the inbound business in Osaka. Deep and broad regional understanding and coordination capabilities form a solid foundation for producing and supporting toursim initiatives in Osaka and a bridging platform for local companies and overseas IR businesses to make a successful IR environment on Yumeshima. “Manages the operations and administration of more than 100 public facilities nationwide such as Tokyo Sky Tree ®, Kyocera Dome Osaka, Harukas 300 (observation deck), Tower of The Sun (Expo 70 Commemorative Park), Tempozan Harbour Village where Osaka Aquarium is located. Recognized as the most trusted private sector facility manager, Actio contributes to the development of communities through global scale venue management such as Expo Aichi, Earth Summit and the Hokkaido Toyako Summit. Capital & Innovation Co., Ltd. The leading – if not only – fully IR devoted media with a focus on IR politics and economy has aquired 100,000 unique monthly users generating 500,000 page views. With expertise in finance and business analysis, information collection and dissemination, Casino IR Japan provides the Local Alliance with media power and IR business know how. and multifaceted business building development with large-scale commercial faciliites such as Universal City Walk and Harumi Triton, Japan Council of Shopping Centers and NPO Building Redevelopment Activation Network are participating as an advising organizations on IR development with a Kansai flavor. Member of the Osaka Bar Association. Goshima launched Kansai IPO Chance Center to increase the number of initial public offerings (IPO) of Kansai companies and he is a representative working with activities to lead the Kansai economy. Vice president of non-profit Doshisha University Industry-Government Collaboration Support Network and lecturer in M & A Theory at Osaka City University. Mainly dealing with M&A, business succession, compliance and corporate governance, preventive legal contracts, corporate restructuring, human resources, venture support, real estate legal affairs and law relating to schools and administrative agencies, CSR and collaboration between industry and academia. Shochiku Kyoto Studio Co., Ltd.
Shochiku movie studios with its long history has produces some of the most famous movies in Japan over the past century. Hundreds of feature films and commercials have been shot at their indoor studios and open outdoor sets which are part of the largest large scale film and photography locations in the country. Their facilities even includes an actor training center. On Yumeshima, Shochiku imagines developing a one of a kind experience drawing from their vast experience in Japanese filmotography. In the modern era where globalization rapidly progresses, the ability to express yourself in English is indespensible. ECC have created a unique educational style that scientifically analyzes the elements necessary for Japanese people to learn English, a style that is reflected in the teaching materials and methods. With 186 ECC Foreign Language Institutes, 16,599 junior classrooms and many other learning locations nationwide ECC is developing a wide variety of language training, educational activities as well as language school administration. Founded in 1960, Milight Taxi is the largest taxi company in Osaka with eleven sales offices and a fleet of 642 vehicles. Milight Taxi is currently developing a taxi dispatch service with Uber, a company active in 600 cities in 65 countries around the world. As inbound customers are expected to increase with events such as Osaka World Expo, Milight Taxi is ready to meet the demand. Their services also includes air port fixed rates rides to both Kansai Airport and Itami Airport. “From funny to special” – there are Osaka souvenirs of every kind. At Sennoya’s three “Naniwa Meibutsu Ichibirian” souvenir shops in Osaka and one in Odaiba, Tokyo. With their “Naniwa special product development team” they work on revitilizing the region and increasing the tourist business with Osaka culture as their resource. In the spirit of their inspirations they Sennoya will deliver “Osaka Charm” to IR. Vice President of the Dotonbori Shopping District Associaton and with the experience long-established Dotonbori stores such as “Fuwa”, “Tororo” ,”Otakoiri”, “Kukuru” and the 100% domestic sweet potato shop “Rapopo Farm”, the Shirohato brand has expanded to over 100 shops nationwide. They aim to promote Osaka’s cuisine and food culture around the world. Established in Sennichimae, Osaka, in 1973, Chibo has grown from a few small shops to being a world class restaurant with 68 locations around the country and nine stores overseas. Standing out as a top choice among the more than 6,000 okonomiyaki shops in Osaka. Chibo brought elegance into the local okonmiyaki and steakhouse cuisine with their brands. Vice Chairman and the up-and-coming young member of the Dotonbori Shopping District Association. With its original crispy outside and soft, creamy inside Creo-ru’s takoyaki is a great representative of the Japanese cuisine to show the world. Under the management philosophy and theme of “Creating Food”, Creo-ru is dedicated to development of IR. Taking the stage for the first time at age three Fumihisa Onishi has a long history within the Nohgaku theatre world. Rising up through the levels of Nohgaku, now a master of the Nohgaku Kanze school, Onishi is an elected association committee member of the Japan Nohgaku Theatre Association. The Osaka Nohgaku Kaikan, a dedicated Nohgaku, Kabuki and Bunraku performance venue for 60 years is now a UNESCO designated Intangible Cultural Heritage site and with Onishi’s help actively promoting the arts it used to host and is looking forward to participate with traditional Japanese culture at IR. PIA Corporation is the leading ticket vendor to various events such as music, sports, theaters, movies, a publisher of books in the leisure and entertainment field as well as web site management. With ticketing experience from events such as the Olympic Games, international conventions, and the Rugby World Cup 2019 Japan Tournament, PIA can leverage its knowledge for IR city development. With 23 restaurants and a total of 1,500 seats in the Kansai area, serving shabu-shabu, sushi, yakiniku among other delicious dishes, LEAF operates the gourmet site “Tabepark” introducing inbounnd tourists to eating and drinking establishments in Japan. With over 300 domestic and overseas affiliated travel companies, 520,000 customers were served in 2017 with projections for 1.5 million in 2020. With know-how of food and drink establishments for inbound tourism, LEAF is looking forward to being part of the IR environment. Managing seven marinas around Japan and capacity for 260 yachts, 120 cruisers, 30 yachts available for rental, clubhouses and tennis courts, including the Osaka Hokko Marina next to Universal Studios and the Yumeshima IR location, Shonan/Enoshima in Kanagawa and Nihama, Ehime. With knowledge of how to securly manage marinas, restaurants and other facilities, biid is in the perfect position to contribute to the customer experience of IR in Kansai. Aviation helicopter company operating out of Kyoto and Okayama. With easy access to Kyoto heliport from Kyoto Station, flights over Kyoto World Heritage Sites and night flights to Osaka are very popular. Takumi Enterprise is eyeing flight access to IR on Yumeshima and improvements to the options for sightseeing in the Kansai area. Being a member of Mother Plus is not only about being a wonderful mother, but it is also a place to shine as an independant woman. Mother plus creates opportunities for social participitation through comprehensive projects for its more then 10,000 members and will work to spread the knowledge about IR to mothers around Japan and beyond its member base. YOLO JAPAN with its human resource network of over 50,000 registered members from over 200 territories, matches and connects companies with diversified and skilled personel and by 2020 aims to be the first official employment office for foreigners in Japan. With IR in Osaka attracting attention from all around the world, YOLO JAPAN is positioned to provide foreigners and companies with channels and opportunities to connect. Direct hand delivery of promotional materials and efficient, targeted advertisement to relevant groups, using other channels than the oversaturated digital mediums. With personal delivery and leveraging the opportunity of NTT phonebook distribution in western Japan, Yamafukudenden’s experience in regional marketing service will support the marketing of IR in the Kansai region. With a focus on the famous geisha street Hanamachi, Exclusive Kyoto introduces the culture of Kyoto, while paying the greatest respect to the area’s traditional rules. Overseas guests are accompanied by an interpreter guide authorized by Kyoto City, enjoy entertainment by geisha and maiko, eat delicious kaiseki – a multi-course extravaganza that celebrates seasonality and natural ingredients – and get photo opportunities of a life time. Vice President of Association of All Japan TV Program Production Companies (ATP) and member of a major television prodcution comapany, Hasegawa is a well known face in the media streams. The producer of a wide range of varitey programs in Osaka and Tokyo he is involved in some of the big-name host productions with main staples as “Kaminuma Emiko O-shaberi Cooking” on ABC, “Hakken! Gyoten!! Premier Mon!!! Doyo wa Dame Yo!” on YTV, and “Mune Ippai Summit” on KTV among others. By focusing on producing Hasegawa handles a number of high viewership entertainment and variety programs where fun and exciting things are promoted. UC RESORT AGENCY Co., Ltd.
Based on the experience from overseas IR sites and utilizing a wealth of knowledge accumulated from years of practical experience, Tomoyuki Kitagaki is an expert on real estate and city development with an IR viewpoint. To reach goals of revitalizing the regional economy and creating new employment opportunities he is supporting the efforts to spread understanding about IR development as a tourism tool. A major player in the MICE business, Innovent Inc. is on a mission to bring better changes to the world by connecting companies with customers through trade fairs, symposiums and exhibition events within food, housing, architecture, leisure and lifestyle. April 2018 marked the first large scale IR even in Japan, “Kansai IR Showcase”, attracting 9,380 visitors with Innovent’s IR team managing the exhibition hall and the company and organization network. Founded in 1950 and with their roots in toy fireworks, Firebrand went on to large scale fireworks and manufacturing, importing and exporting, event production, contributing to the development of Japanese fireworks with a new era of pyrotechnics. They are committed to producing entertainment shows with their fireworks at outdoor events, festivals, school festivals, weddings, pursuing the intiative bring a smile to people’s faces under the slogan “A moment of shine, a memory for life”. Firebrand is also collaborating with other industries such as fragrance and robotics while continuning to develop their fireworks. Honored with a ranking as the 103rd company in the “FT1000 High-Growth Companies Asia-Pacific” by the Financial Times and their 1.5 million readers worldwide, Suprieve has been labled as a company with the “western Japan temporary staffing company with ability to grow by utilizing their nationwide one million talented people”. Ranking 14th among Japanese companies and 1st in western Japan. With its own network of 30 locations throughout the country their resources will be incredibly valuable to recruite talented IR staff nationwide, retaining staff to foster know-how. Osaka Kizu Whole Sale Market Co., Ltd. Through collaborations such as the Dotonbori River Festival with Osaka Prefecture, Osaka City, Osaka Convention & Tourism Bureau, shopping district associations, and local companies and organizations, Osaka City Shopping Association with Senda as preident, aim to manage a variety of events to revitalize and develop meaningful tourism in the Osaka and Kansai area. With 463 local associations and 415 youth sections around the country with 35 years of history, the Chamber of Commerce and Industry Youth Associations (YEG) is a place for the next generation business people to learn through education and exchange about their regional economy and develop their own companies. Under the slogan “One Rank Up Kinki!”, the Kinki block members are working together with activities and collaborations among the 52 Kinki associations and members all over the country. The Young Entrepreneur Group of the Kyoto Chamber of Commerce and Industry gathers business managers and the next generation entrepreneurs in the Kyoto region. With over 300 members working under the slogan “Trust Is Powerful”, promoting business focusing on human resources, entertainment and international business toghether with YEG’s around Japan. Being affiliated with the Local Alliance we will promote cultural exchange and contribute to the creation of an enriched and city landscape. Basing their business on the philosophy of “Enhancing the region with ideas and concepts”, the well-established Katgetsukan inn on Awaji island was rebuilt to revitalize the the facility and reflect the region’s charming character. Centering on Awaji island, 20 facilities including inns, hotels, marine resorts and more are included in the portfolio. Connecting IR on Yumeshima with Awaji will create a route also leading to greater Kansai, Shikoku and the Chugoku areas. Tokushima Prefecture is the only area of Shikoku to be part of the wider Kansai area, joining Shiga, Kyoto, Osaka, Hyogo, Nara, Wakayama and Tottori. Naruto City is Tokushima’s gateway to Kansai connecting to Hyogo Prefecture and Kobe via the Awaji Naruto Expressway. 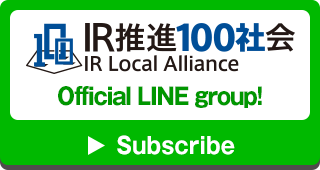 There has been enthustiastic expectiations and activities regarding IR in the Naruto area for over ten years and by being affiliated with the Local Alliance, vice chairman Yoshihiro Tomita and the Chamber of Commerce and Industry will support its cause. Akihiro Nakanishi has been studying the casino revenue systems in Europe and the way they give back to society since 2003 an is aiming to develop a health care facitliy in Naruto City, utilizing the local natural beauty. A long time driving force behind IR legalization in Japan, Nakanishi togehther with the Naruto Chamber of Commerce and Industry is joining the Local Alliance to support its activities. PC: Click the “Subscribe” button and scan the QR-code to subscribe. Smartphone: Tap the “Subscribe” button to subscribe. For smarthphones, click the Subscribe button to register with your LINE account. ©2018 IR Local Alliance All rights reserved.